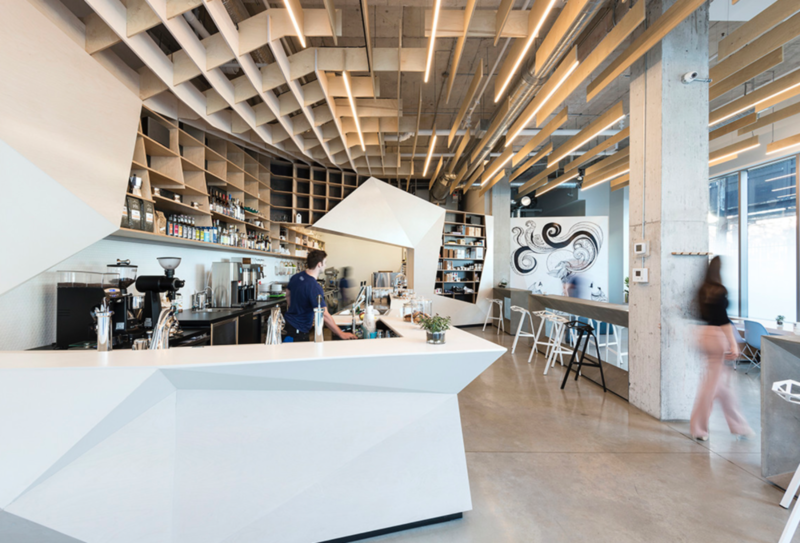 In downton Toronto's east end is the Odin Bar + Cafe, a beautifully designed space that creates a unique interior setting. During the day Odin offers coffee, teas, pastries and sandwiches, and in the evening the bar pours craft beers and Ontario wines. 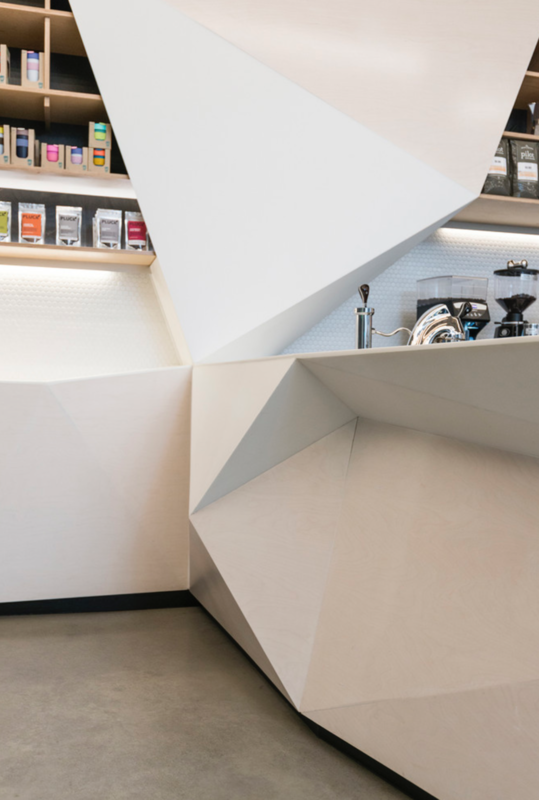 Inspired by Scandinavian design, architects Phaedrus Studio created an angular design for the space, that resembled blocks of rock and ice. The furniture, floor, ceiling and decorations all compliment each other by using relatively neutral tones, however all feature unique textures and patterns that create interesting surfaces to look at. 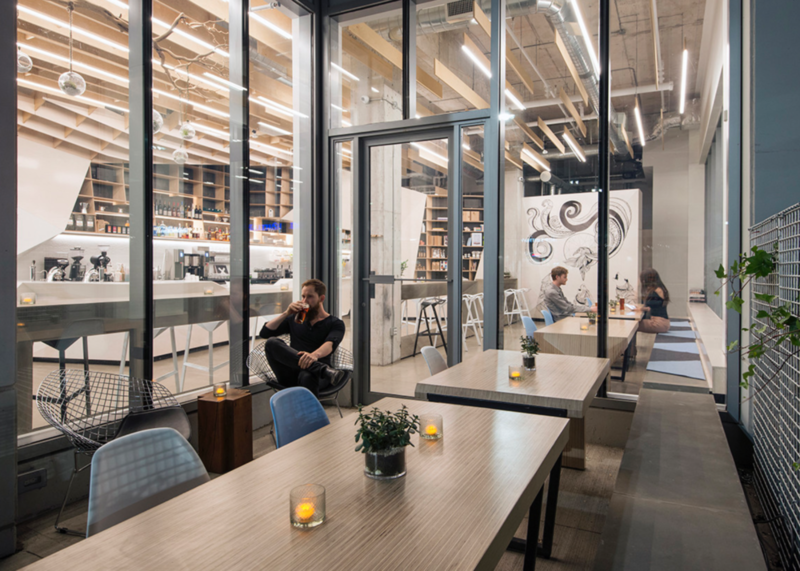 Photographs: Designstor & Ryan Fung. Click or tap to enlarge. 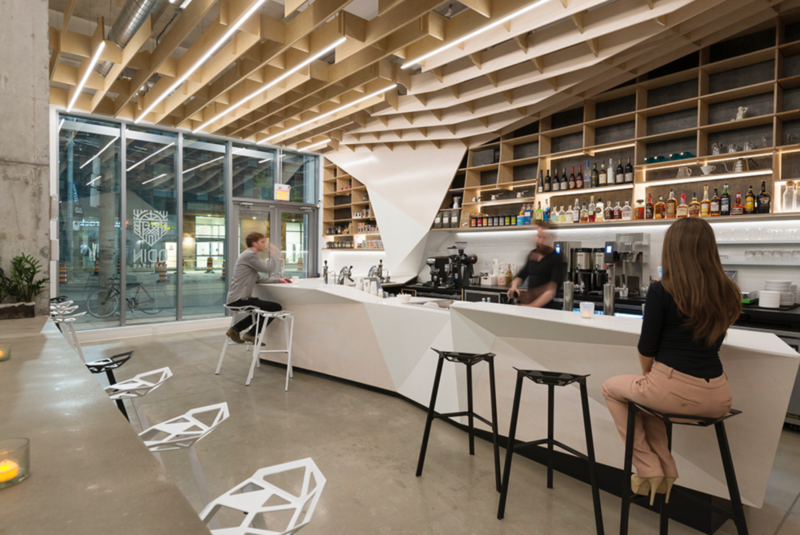 All of the furniture has a modern form, from the angular, white bar to the narrow concrete tables and tall geometrically shaped stools. Individual items, such as tables look like sculpted pieces of contemporary art which fit beautifully in this urban setting. Discrete decorative elements are nestled throughout the store such as candles and plants on each table. Overhead is a rather unique decoration comprised of plywood blocks hanging from the tall ceiling. They are all aligned in the same direction adding a sense of flow and consistency to the walls. Hanging down they create a more intimate setting by 'lowering' the ceiling, without trying to mask the grunge of the concrete above. 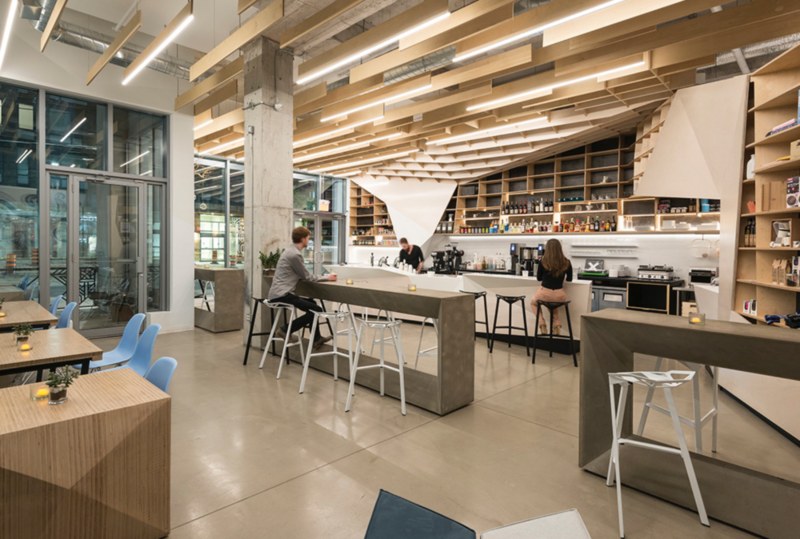 Everything in the space below is beautifully designed so the plywood blocks tie the contemporary and natural-inspired furniture to the 'raw' concrete ceiling with visible air conditioning and electrical wires. This adds to the modernity of the design and it is fully embracing the the whole space, from floor to ceiling. In the evenings, this minimal, calm space transforms thanks to the integrated lighting throughout the room. The bar and wall areas feature large white spaces which are illuminated with warm colours to give the setting a more energetic feel. 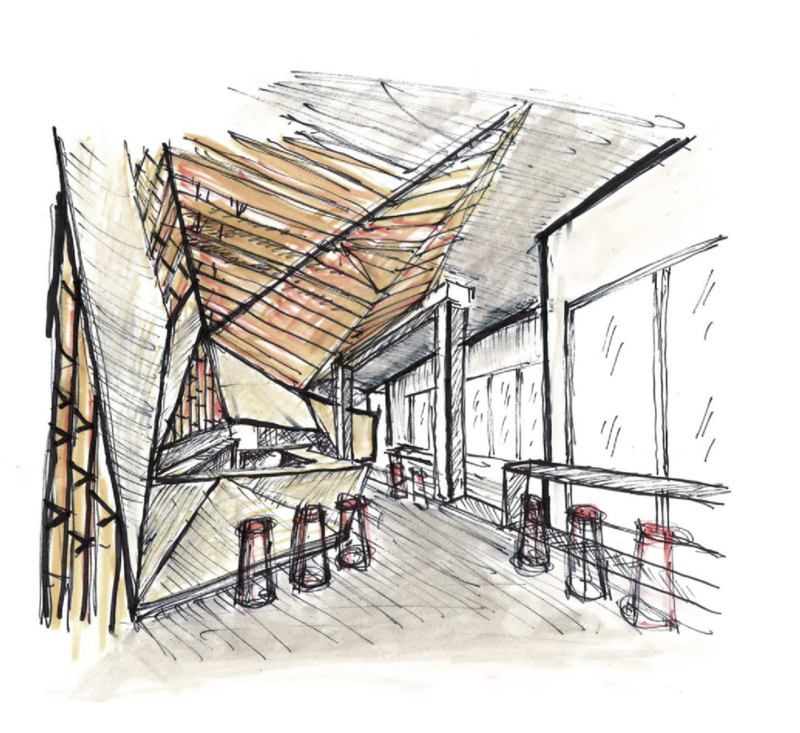 The Odin Bar and Cafe has a beautiful aesthetic design and has highly rated food and drinks. If you're in the Toronto area and want to pop by, more information can be found on their website. Photographs: Designstor & Ryan Fung.